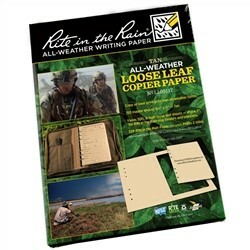 Copy or laser print your own all-weather forms, charts, maps and worksheets on Rite in the Rain All-Weather Tactical Color Copier Paper. Protect your data and yourself with tinted Green or Tan Copier Paper. Tinted sheets also reduce glare in bright sunlight. Paper is 8 1/2 in x 11 in and 20# sub bond. Completely recyclable wood-based paper!